An OEM Board for direct sACN/E1.31 and Art-Net to RGB/RGBW pixel strip/array control with 4 Independent outputs each with 5A supply capability. Can drive a total of 2720 pixels. Includes DIN rail and wall clips ($10 value). No longer do you need sACN/Art-Net -> DMX512 -> Pixel driver. Eliminate the DMX512 conversion using our LeDMX4 PRO and go direct sACN/Art-Net -> Pixel. Compact and feature packed you'll find it easy to design into your applications with the ability to scale as big as you like whilst keeping everything synchronized. 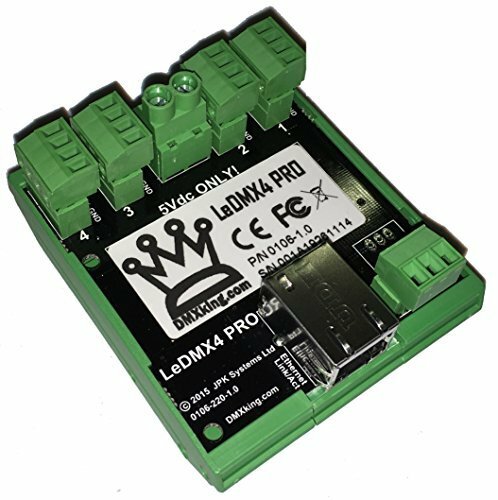 Designed and manufactured in New Zealand to the highest standards LeDMX4 PRO is a professional product you can rely on backed by our world renowned after sales support. Firmware v2.6 LeDMX4 PRO now offers ArtNet/sACN stream merging and sACN Priority overrides giving end users the ability to bring the best of different lighting control systems and media servers together seemlessly. No other pixel controller offers such flexibility. Firmware v3.0+ LeDMX4 PRO includes show recording and playback from microSD card complete with sACN Priority override from an external source during playback providing many possibly use scenarios. Trigger show playback via Art-Net, sACN, DMX-IN via Port A and external contact closure. Directly drives WS2811, WS2812, WS2812B, WS2813, UCS1903, UCS2912, PL9823, TM1934, APA102, APA104, APA106, INK1002, INK1003, SM16703, SK6812, WS2801, LPD6803, LPD8806 and many more compatible LED strips. Up to 680 RGB pixels or 512 RGBW pixels per output spanning 4 DMX universes (2720 RGB pixels / 16 universes per board). Art-Net broadcast, Art-Net II, 3 & 4 unicast, sACN/E1.31 Multicast and sACN Unicast support. Bonus DMX512 OUT/IN port. Supported operating systems: Any with Ethernet networking support. Windows, Mac, Linux, iOS, Android. If you have any questions about this product by DMXking, contact us by completing and submitting the form below. If you are looking for a specif part number, please include it with your message.